McDonald's All-American Game Standouts - Who shined throughout the week at the #McDAAG? 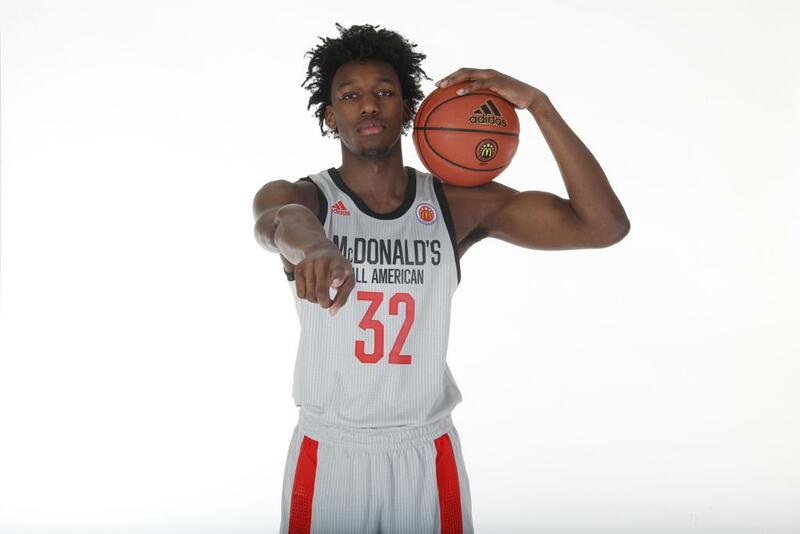 Who Shined at the McDAAG? It’s not easy to separate yourself in such a talented field of players, but a few prospects definitely stood out more than others. Here are some of the players who shined at this year’s McDonald’s All-American Game. If you were following McDonald’s All-American coverage through the week, it was hard to avoid the numerous tweets and articles written about Isaiah Stewart’s performance. The La Lumiere (IN) big man brought a high level of intensity from the jump and was dominant on the boards. Stewart gets the absolute most out of himself and didn’t take any practice or event he participated in for granted. The Washington Huskies are certainly getting a winner in Stewart next season. Anthony didn’t necessarily play up to his potential during the practices, but he delivered when the lights were on during the scrimmage and the game on Wednesday night. The Oak Hill Academy (V.A.) product controlled the pace and showed off his scoring ability and court vision. The combination of his talent and knowledge of the game stood out on the big stage. He showed why he will be running the show with whatever program he suits up for next season. When it comes to intriguing long term prospects, few are as intriguing as Precious Achiuwa. He is one of the toughest players to match up with as he is a 6’8” forward capable of playing both in the post and on the perimeter. He didn’t necessarily play the best during the practices or scrimmages but shined on the biggest stage in the McDonald’s All-American Game last night. Achiuwa scored 22 points and grabbed 9 rebounds. Florida Gators commit Scottie Lewis made a statement throughout the week at the McDonald’s All-American Game. Similar to Isaiah Stewart, Lewis brought the same high-level intensity to every activity during the week. He played to his elite athleticism and as always, he brought it on the defensive end. Lewis received some of the most praise from the NBA scouts in attendance. He definitely raised his stock with his performance throughout the week. Trendon Watford put together a nice group of performances throughout the week. As a prospect who is ranked in the 20s and on some sites in the 30s, I believe Watford is deserving of a bump up in the rankings. It’s scary to think he was one of the most skilled prospects in attendance and add the fact that he stands 6’8”. A lot of the talk surrounding him was his recruitment, but Watford was able to tune that out and put on quite the show at the McDAAG. If I had to pick a top performer for the week, it would be a tough decision between James Wiseman and Isaiah Stewart. Wiseman backed up his big reputation and then some. Prep Circuit asked a lot of the players who was the most entertaining to watch out of everyone participating and Wiseman was a popular answer. With an impressive skill set, he isn’t your typical 7’1” big man at this stage. He had a lot of success not only in the paint but also when stepping it out and knocking down mid-range jump shots. The NBA scouts who were in attendance must have been impressed with ESPN’s number one ranked prospect in the nation. No one helped themselves more than Louisville commit Samuell Williamson. Williamson was one of the biggest surprises when the list of this year’s McDAAG players came out, but he made the committee look very smart for selecting him. He showed off a very consistent mid-range jump shot and had a lot of moves to turn to when breaking down defenders off the bounce. He is this year’s biggest sleeper and could definitely skyrocket up lists after his play this week. Kentucky commit Tyrese Maxey is a natural scorer and it showed this week. Maxey converted off the bounce and as many saw in last night’s game with his jump shot as well. He scores in bunches and when in rhythm there are few who can compete at his level. He plays at a very fast pace and is an excellent playmaker, which is a lethal combination. Kentucky fans would have been happy with his play especially toward the end of the week. Like Williamson, Oscar Tshiebwe was one of the biggest surprise selections for this year’s McDonald’s All-American Game. It’s safe to say he made the most out of his opportunity and was dominant at points in the paint. There are few players that compare to his physical build and he used that to his advantage on both ends. West Virginia is not only getting one of the best big men in the class but one of the biggest competitors as well. Jalen Terry, a class of 2020 PG from The Family (MI), just announced he has committed to Michigan State. Jacques Glover, a class of 2019 PG from Bearden (TN), has committed to Florida. Mounir Hima, a class of 2020 Big Man from St. Benedict's Prep (NJ)/Team Rio, just picked up an offer from Robert Morris.